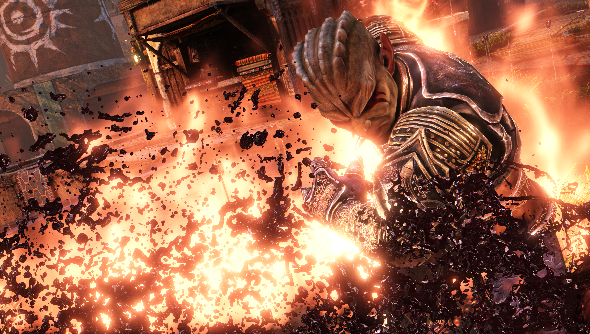 Nosgoth, the vampires vs humans multiplayer bloodbath, will be finally be available to one and all from January 21st. The game is heading into open beta from next Wednesday, meaning anyone and their mouse-trained dog can join in and contribute to the gothic slaughter. Unlike the last open beta weekend, this time the deal is not a limited-time-only affair. From Wednesday 21st onwards Nosgoth will be permanently in open mode, ready to embrace the widest population of PC gamers. And it’s an opportunity you should certainly consider: Fraser found it a surprisingly enjoyable romp in his preview. If Nosgoth has been off your radar, it’s a 4v4 free-to-play multiplayer game, pitting melee-focussed vampires against gun-wielding humans. There’s an interesting balance in its asymmetry, and the level of challenge is akin to the delicate death dances of a MOBA rather than the quick-kill mentality of a shooter. Each class is exceptionally distinct, making it a game with varied and interesting play opportunities. The PCGamesN staff are pretty divided on it – not everyone shares Fraser’s enthusiasm for Nosgoth – but that’s even more reason for you to try it out for yourself. The open beta starts Wednesday, January 21st, at 6pm GMT / 7pm EST.